AGED 76 YRS. 4 MOS. 9 DYS. IN THE 46TH YEAR OF HER AGE. 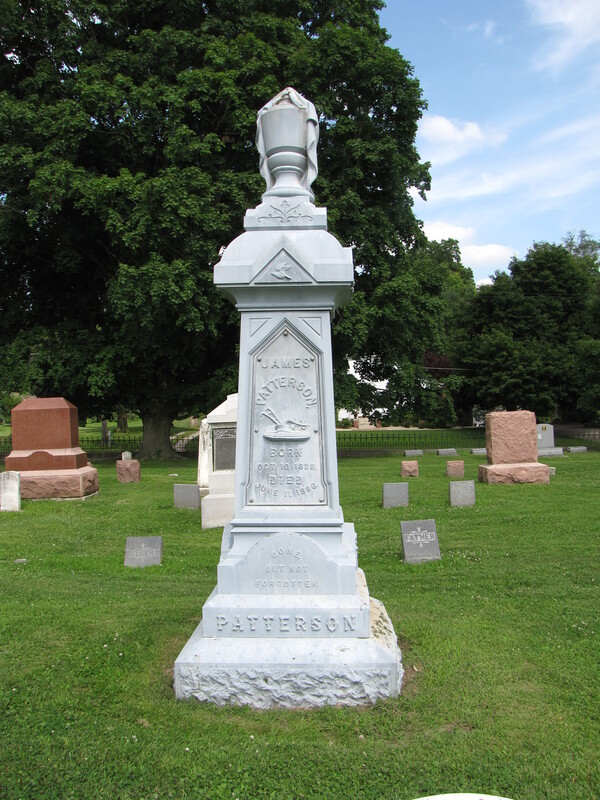 “White bronze” or zinc cemetery markers were manufactured from the 1870s until 1912. The markers are distinguished by their bluish-gray tint. The markers are not bronze but actually cast zinc. The zinc is resistant to corrosion but the zinc becomes brittle over time and cracking and shrinking can occur. The plow is another one of the “farm” images found on this marker. According to some sources the plow symbolizes the harvest; just as the scythe, the plow can represent the reaping of life. 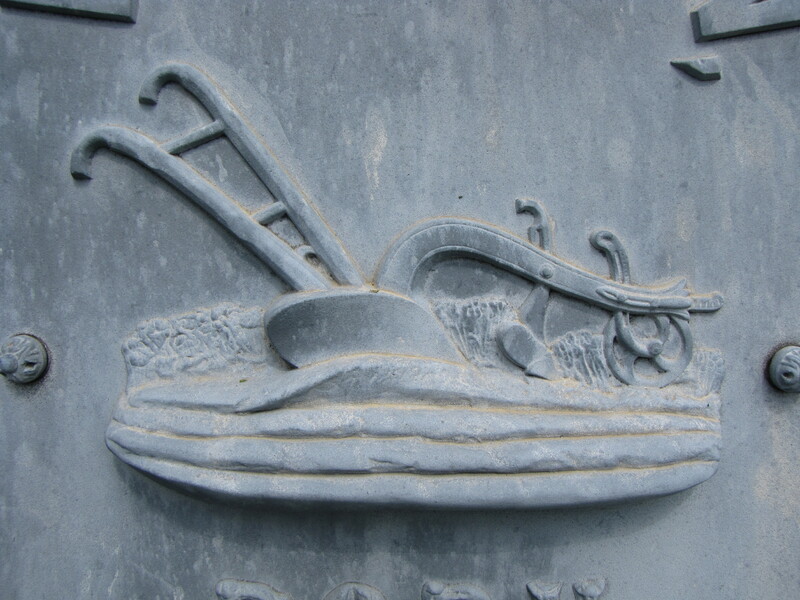 This may possibly be a tribute to the deceased profession, as well—a farmer—as it represents one of the main implements of farming. Wheat’s origins are unknown but is the basis of basic food and a staple in many cultures. Because of wheat’s exalted position as a mainstay foodstuff, it is viewed as a gift from Heaven. 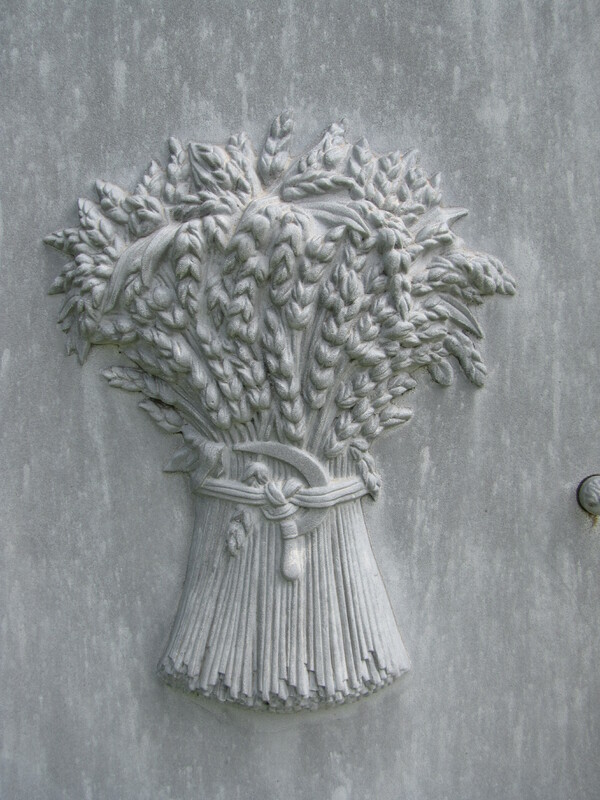 Wheat symbolizes immortality and resurrection. But, like many symbols found on gravestones, they can have more than one meaning. For instance, because wheat is the main ingredient of bread, the sheaf of wheat can represent the Body of Christ. Wheat can also represent a long life, usually more than three score and ten, or seventy years. The urn, of course, is a container used to hold the ashes or the cremated remains of the dead. 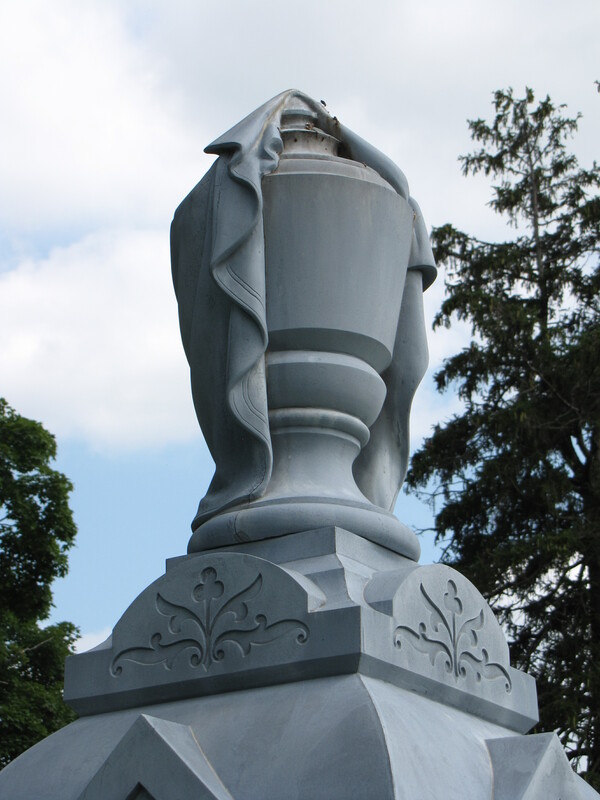 In this case, the urn is draped and serves as a finial for the marker. The drapery either represents a shroud representing death and sorrow, or can also be a motif that represents a veil that separates the earth and Heaven. Corn is an ancient American crop that has been exported to all corners of the world. It is not only ubiquitous in our Midwestern fields but corn syrup is in nearly every food on the grocery store shelf. 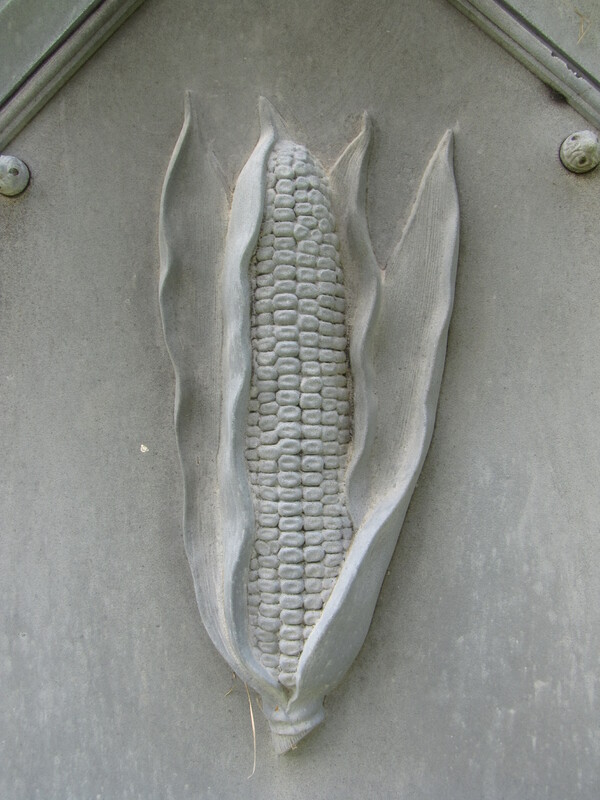 It is right and fitting then that corn represents fertility since its abundance is obvious. It also represents rebirth in funerary art.